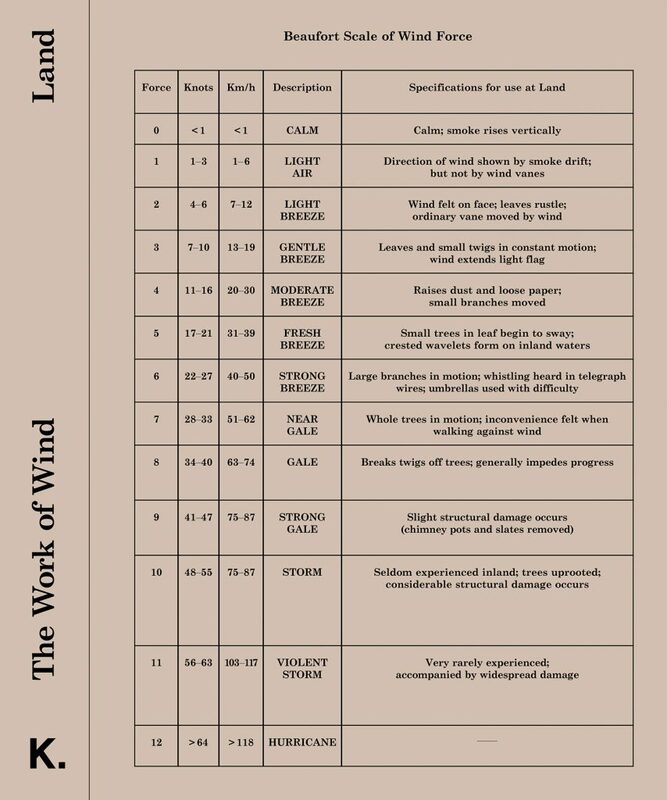 The Work of Wind: Land contains a reflective essay on the Beaufort Scale, an intermezzo off the scale, and thirteen responses to the scale’s thirteen distinct forces. Continuing K.’s curatorial approach to publishing, this publication invites the “reader-as-exhibition-viewer” to navigate a broad multidisciplinary field of inquiry and experimentation, sensing a rise of intensity in form and content as the pages turn from 0 (Calm) to 12 (Hurricane). Contributors include artists, curators, atmospheric scientists, designers, poets, oceanographers, architects, anthropologists, art historians, media archaeologists, geologists, sociologists, economists, physicists, geographers, and more.